Lieutenant General Harold “Hal” Moore was a decorated and famous member of the United States Army. He was the first member of his West Point class to be promoted to 1-star, 2-star, and 3-star General. The popular book and movie We Were Soldiers Once … And Young colorfully detailed his role as a Lieutenant Colonel and as the commanding officer of the 1stBattalion, 7thCalvary Regiment in the first major battle involving the American military during the Vietnam War. 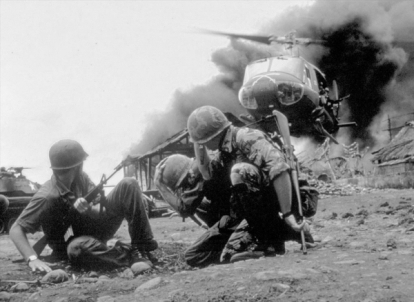 This week-long battle, starting on November 14th, 1965, saw innovations in warfare including the first-ever helicopter air assault, but its mixed outcome may have convinced the leadership of North Vietnam that they could ultimately defeat the Americans in a prolonged and bloody conflict. In We Were Soldiers Once … And Young, Moore offers his overarching thoughts on American history and culture. He boldly stated: “There were two great tragedies in the twentieth century. One was the decline of morality in our country. The second was the war in Vietnam. It was an unnecessary war.” What a telling and thought-provoking comparison on this Veteran’s Day weekend and 53rdanniversary of the start of that conflict! Over 58,000 American servicemen died in that “unnecessary war.” Additionally, over 200,000 South Vietnamese soldiers died and over one million North Vietnamese military members perished. Finally, over two million civilians died during the conflict. Yet, according to Moore, the decline of morality in our country is equivalent to all of that. Even if he is only partly correct in this powerful statement, then Christian Americans must awake and act. PLEASE PRAY FOR AN IMMEDIATE AND REMARKABLE REVERSAL OF THE MORAL DECLINE OF AMERICA. May our faithfulness, our prayerfulness, our humility, our repentance and our godly passion reverse the tragedy involved in the moral decline of our nation.